So I wanted to do a test post as I am continuing in my crash course in WordPress & blog creation. I am very anxious to get things going but there are a few things that I do have to figure out still. You are definitely going to get to observe my learning process, but I want to make that part as painless as possible for y’all. So the other day we had some friends over, and there was a request for something with some kick.These jalapeno poppers seemed like the right answer to the question. 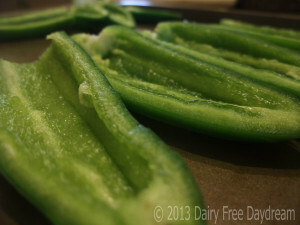 Here’s a pic of the sliced jalapenos before adding the stuffing to them. That post with the full recipe should be soon to follow. For now, going to see how this translates onto the site. 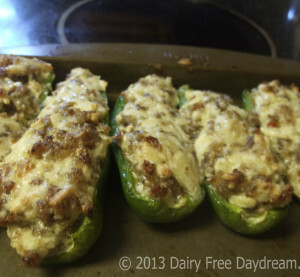 Add in sausage or tofu crumbles, Daiya shredded mozzarella and Tofutti cream cheese, and bake until they just start to brown on top. They did not last very long, and the conversation quickly turned to wrapping them in bacon next time.